When someone mentions the word camp, we usually associate this with putting up a tent, then sleeping underneath the sky filled with stars. To some people, this is the kind of adventure you experience in the woods or whether you can imagine. To teachers and organizers, however, this is forming a team to discover more about a particular subject matter, an example of which is basketball camps. To sharpen up your basketball skills, Larry Hughes offer Basketball Training Program is very efficient for all athletes. These days, talking to you about your technique is one thing, but showing it to you is quite another. At Larry Hughes Basketball Academy day camp incorporates daily video analysis of your shooting form and overall technique to make sure that you can really see how to improve quickly. Sounds funny, but it’s not. With so much of the game being mental, and being able to think 2, 3 and 4 plays ahead, some of the top basketball camps have begun offering classroom components to their schedules, breaking down basketball related concepts that can be directly applied to the court. This can be invaluable to your development, so make sure you don’t focus on just the basketball camps that provide skills drill background but also enhance your leadership quality. The top basketball camps out there will teach you far more than just how to shoot, pass, dribbled and defend. There are so many skills you can learn and apply in your everyday life that you are far better off attending a camp that offers leadership training, tips, and tricks on how to thrive in a team environment. 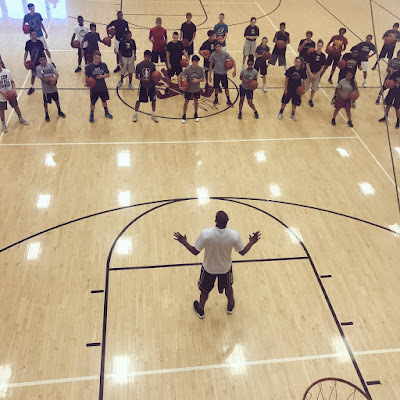 The staff members of the Larry Hughes Basketball Academy Camps will our athletes the drive and motivation they need to improve themselves both physically and mentally giving them the edge they need in this competitive sport. Each facility has a group of professional staff members on board with occasional guest speakers to teach and motivate every young aspiring athlete on camp. Each of our staff members are all trained in basketball and physical exercises to ensure that during the campers stay in summer basketball camps they will experience a fun and learning environment. Now get splendid success by joining Larry Hughes Academy in St. Louis, MO!